Vindolanda is my favourite site to visit when we go up to Hadrian’s Wall. It has everything a history lover could want: ancient ruins to walk around – with an ongoing archaeological ‘dig’ during the summer months – and reconstructions of parts of Hadrian’s Wall. There is also an excellent, award-winning museum housing many of the finds from the dig. The scenery around the site and the landscaped gardens and little stream close to the museum are a delight in themselves. Gardens where altars have been placed against a wall. The x marks the approximate location of Vindolanda. The photo is of an information board at Housesteads fort. The fort, and the settlement that grew up with it, were first constructed four decades before Hadrian decided to build his wall. It formed part of a line of a few forts along the Roman road known as the Stanegate (Stone Gate). 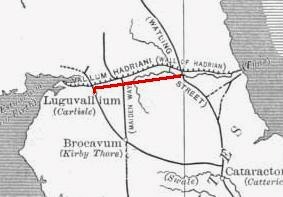 By the time the building of Hadrian’s Wall began around AD122 there had already been four forts and towns on the site (wood rots!). At its height, Vindolanda would have supported a population of 3-4000, of which 1000 would have been largely auxilliary soldiers. The rest was made up of the soldiers’ families, traders and merchants, servant and slaves. People from all over the Roman empire would have lived here: from North Africa, Spain, Syria, France (Gaul/Gallia) and Germany and Italy itself. Hence there would be a great variety of customs, diets, dress and dialects. While Hadrian’s Wall was under construction, Vindolanda became a sort of ‘base camp’ for the legionaries and many workers involved. Once the Wall was completed, Vindolanda formed part of the Wall garrison, despite being a mile south of the actual Wall. But the population of Vindolanda was always on the move, shifting from one ‘posting’ to the next, and the majority of the people would have gone with them. At one point, between AD280-304/5, the site was abandoned and lay derelict, and was rebuilt in AD305. Excavations have unearthed remains of a large bonfire on the site. It had been used to destroy all the household goods of the prefect/commanding officer at that time as his household prepared to move on to another site. At he bottom of the huge pile of remains, many letters and other communications had survived: wonderful archaeological evidence of life up on the Wall at that time. All this construction and rebuilding work meant that in places it has been necessary for archaeologists to dig down as much as 7 metres below the original ground level to reach many of the ‘finds’. But the constant renewal of the site also helped to create the excellent preservation conditions (anaerobic/anoxic levels) where there is little or no oxygen. 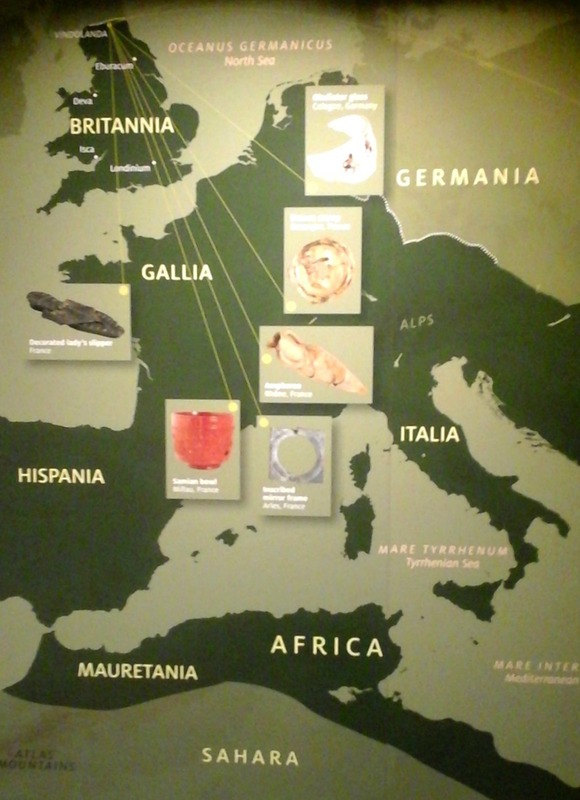 Photo of excavation work at Vindolanda from a display board inside the museum. The ruins need to be viewed in two parts. First there is the fort. Although there is still a lot of it to be excavated, some buildings are clearly identifiable. Most of the outer walls and gates are visible, as well as both the NE and SW corners and a latrine. As all Roman forts, this one had the typical playing-card shape (rectangular with rounded corners). It also had the three central and most important buildings of every fort: the headquarters building; the commanding officer’s/prefect’s house and the granaries. Then there were the other usual buildings such as the soldiers’ barracks, latrines and so on. I don’t intend to describe all these here because my next post is about a single fort (Housesteads) and I’ll be talking about that then. 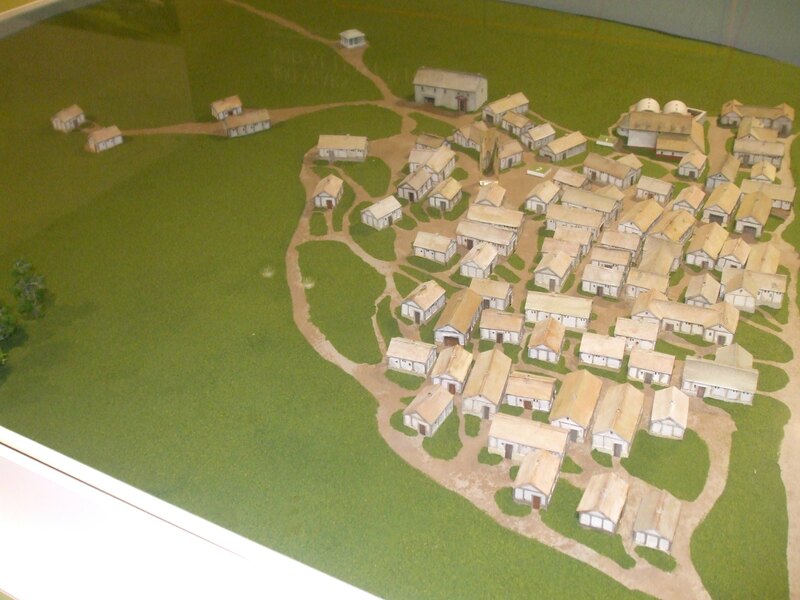 What I’d like to focus on now is the vicus at Vindolanda – the settlement that grew up outside the walls of the fort. 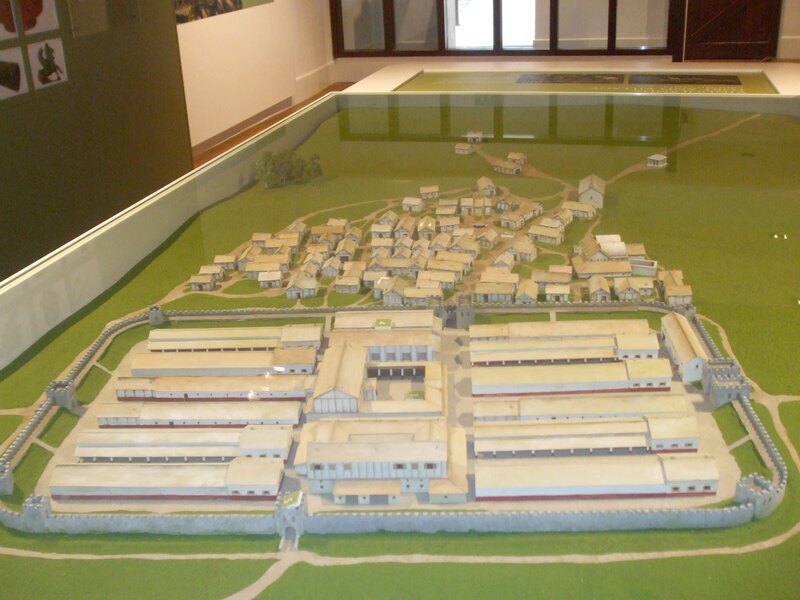 Model of the fort and vicus at Vindolanda in the entrance to the site. The present day ruins are quite incredible and give us plenty of insight into everyday life in a Roman settlement at this time. I couldn’t possibly describe all of the different remains in a single post but they included everything from temples and mausolea, shops of various types, a tavern and workshops to a military bath house, wells and water tanks. General view across to the reconstructed turrets. Workshops flanked the main road through the vicus. Tavern. This was next to the workshops and the west gate of the fort. It was the largest building in the vicus. ‘Strip houses’ were long and narrow, with their narrow edge facing the street. Tax was determined according to the amount of street frontage. Finds from the dig have produced the most important archaeological discovery of the last 50 years: the writing tablets. They are currently housed in the museum – on loan from the British Museum in London – and displayed in an hermetically sealed case, protected from the decaying effects of oxygen, moisture and humidity. Vindolanda Writing Tablets, shown on an informaton board in the Vindolanda museum. Letter from Claudia Severa to Sulpicia Lepidina. The first writing tablet from Vindolanda was unearthed over 30 years ago. It was one of the most important archaeological discoveries in Britain since 1945. The collection of about 2,000 documents is an invaluable source of information about life in the Roman army on the northern frontiers during the years immediately before the building of Hadrian’s Wall. The tablet I always loved is one from Claudia Severa to Sulpicia Lepidina, the wife of the garrison’s commanding officer in AD100, inviting her to her birthday party. But the largest tablet is a four page one from Octavius to Candidus, listing business transactions between Vidolanda and Catterick Roman fort in Yorkshire, roughly 68 miles away. It contains the amusing phrase ‘the roads are awful’! Other ‘finds’ from the dig include armour, shoes, socks, wigs, wood and leather items, textiles, glass, pottery, ironwork, inscriptions and sculpture. 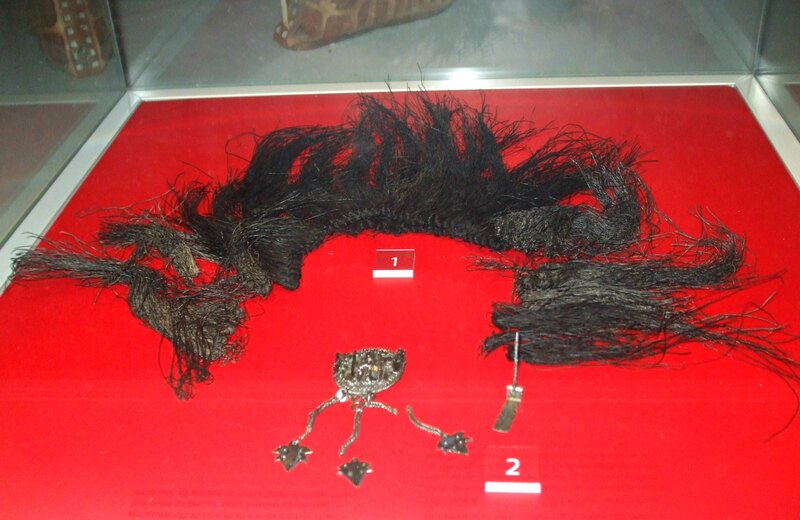 One of the most impressive finds is the hair-moss crest from a helmet, now housed at the Roman Army Museum at Carvoran, where we photographed it. That museum is also run by the Vindolanda Trust (so, unlike some of the other sites along the Wall, these two are not run by English Heritage or National Trust). To finish with here a a few photos of the Temple to the Water Nymphs and a couple of altar stones outside . . . Following the Roman period the Vindolanda site was of little importance to anyone other than farmers and those needing stone to build their houses. Odd artefacts turned up occasionally, but the reality of what lay beneath the soil remained a mystery. When more and more finds were made, in 1832, the Reverend Anthony Hedley built his new house on the site and called it Chesterholm. The house is now an integral part of the museum. He also made the first real steps in preserving the site. Yet it wasn’t until 1929 when young scholar, Eric Birley, bought the property that the amazing potential of Vindolanda came to light. He ran the first series of excavations, but the Second World War put a halt on things for a while. After the war, excavations continued, and the site stayed in the hands of the Birley family until 1970 when Eric’s son, Robin, handed it over to the Vindolanda Trust on behalf of the nation. I haven’t done credit to the Birley family here as this post is rapidly becoming a book! But if you visit Vindolanda during the summer, you may catch a glimpse of one or the other of this awesome family, still happily digging away. Previous Books, Writing Reviews and Confusion. What a wonderful post millie! Love the photos, such variety and amazing! Thanks Lynn. Vindolanda is wonderful place to learn about Roman life at that time. Shew Millie how incredibly interesting. You just have this wealth of information. I wish my my history teacher at school had taken a leaf out of your book ! Ha ha. I admit, I find all history fascinating, Lynne, so I enjoy writing about places I’ve visited. This post was a long one because there were so many interesting things to say about Vindolanda. This is fabulous! I am fascinated with the shoe (showing the sole, with a read background). Do you recall what was on the bottom? Beads? Pebbles? What? If I ever get to England, I will definitely visit this site. I know you love history, Dinata, and I’m sure you’d really enjoy Vindolanda. It’s well worth a visit. They are simple metal studs on the bottom of the shoe, most likely to give extra protection to the sole, which was just the same thin leather as the rest. They look like brass in the bright lights, but I think they were just iron. Another fascinating post, Millie! Goodness, but I do love it when they show those wonderful models of the buildings — makes it so much easier to imagine, when you’re looking at the ruins themselves. What an interesting fact about the documents found at the bottom of the bonfire, unburned after all; I think I might have to sneak that into one of my stories! The content of the writing tablets is also so interesting. I love being reminded of how people from such very different ages and technology were so similar in everyday ways, like complaining about the roads, and inviting each other to parties. What a great museum and site. I can see why it’s one of your favorites! Yes, the models are very useful for getting your bearings, and most of these sites seem to have them on display. There are always guidebooks with printed plans for visitors, too, but I can’t photograph those due to copyright. So the models are great to show on my posts. The bonfire info. is so interesting, isn’t it? There just wouldn’t have been enough oxygen down there to support burning – very useful for us! The letters are brilliant and, as you say, show us that people from so many different times were no different in their everyday dealings and friendships. I’ve lost count of how many times I’ve been up to the Wall, but I make sure we go to Vindolanda every time. The displays and lay out have changed a lot since the early 90s. Thanks,Joy. Enjoy your Camping trip. So interesting! I would love to visit a archaeological ‘dig’ one day!! Thanks Aletta. Digs are wonderful places, especially when exciting finds are made. 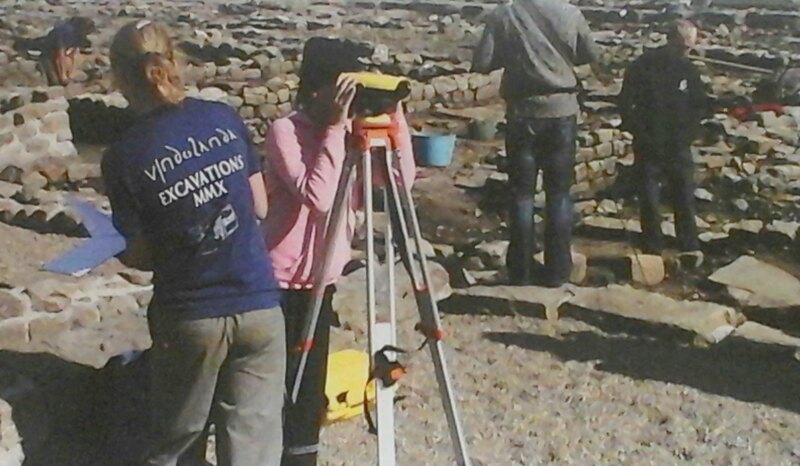 Our eldest daughter’s an archaeologist, and has worked on several digs It’s not too wonderful in bad weather, though – which is often the case here in the UK. What a intriging site and so full of information about life at the fort. It must have been difficult for the soldiers living in this outer frontier.At least the red moss helmets brought colour and panache to their lives I love that red one. Thanks, Amanda. Yes, few Roman soldiers liked being away from Rome! The weather in Britannia was far too cold for them. Yet many of them were here for the rest of their lives, marrying local women and making a life here, even after retiring from the army. I believe that helmets with crests like the red one were only for the’elite’ officers. 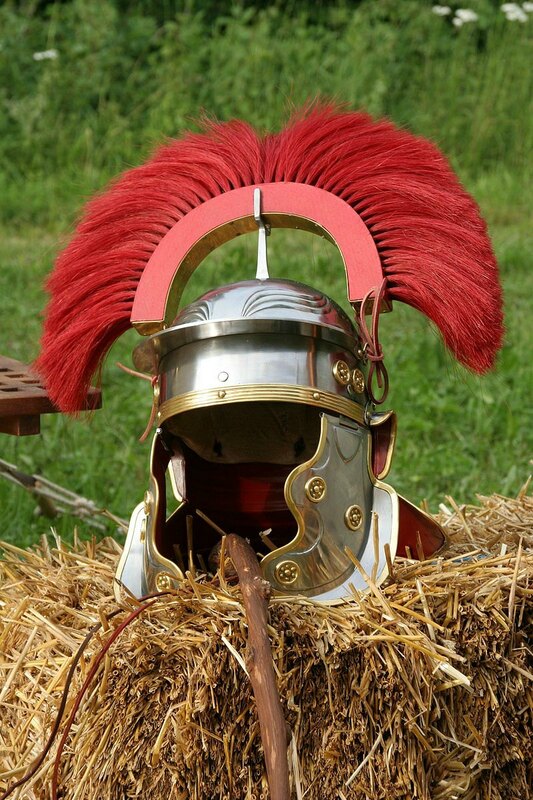 Some centurions were said to have worn them into battle. Vindolanda is a fascinating site, with so much to see. It’s been updated a lot since I first visited with school children in 1991. I went for seven years running with the school and have been dozens of times since. It’s great to see the digs going on, too. Yes, they were all Year 7, our youngest year in school (11-12 years) and they loved the trip up there. We used to take two coachloads of them – 80 kids, so we had the youth hostel mostly to ourselves, which was great. They all loved Vindolanda, but they also enjoyed walking along the Whin Sill ridge, on which the Wall was built. You can actually walk on the Wall itself in places. It was easy for them to write poems and stories about the life of a soldier up there. We had some fabulous creative work from them and their orienteering skills developed well. (Ideal for satisfying the necessary cross-curricular links). Those writing tablets are amazing Millie! I love all of the pictures..what a great place to visit. Such an amazing history! The writing tablets are what Vindolanda is most famous for. The are amazing evidence and fill in so much detail about life in Roman times 2000 years ago. It’s a popular place for visitors from all over the world – as is the rest of Hadrian’s Wall. Thank you for liking my post, Antonia! Love, Love, Love this post Millie. So looking forward to going to the wall myself. Almost can’t wait now!!! I just hope you have good weather, Cameron. It can be pretty bleak up on the Whin Sill in the rain. At least June won’t (or shouldn’t!) be cold. I was up there once with the school in April and it snowed! It was flippin’ freezing, I can tell you. 😀 Thanks for the kind words about my post. Pleasure and thanks for the advice on the weather at the wall… I really notice the cold since my weight loss…..
I’ve heard people who’ve lost a lot of weight say that before. It’s usually warm in June, but who knows in this country what the weather will be! My brother would love this, he’s on a field trip in York at the moment. Great information thank you. York is a wonderful city. In fact I’ll be up there from tomorrow (Friday 8th April) until Tuesday. We’re visiting a Viking village at Murton on Saturday, so decided to make it a long weekend. I hope your brother enjoys his field trip there. There’s so much to see and do in York itself, as well as the surrounding area. If he’s a history lover, there’s so much to see all the way along Hadrian’s Wall. Vindolanda’s a very special place, mostly because of the excavations – and finds, of course. The writing tablets are simply amazing. Thanks, Charlotte. Great post, Millie! This was so interesting. How exciting that so many artifacts survived because of the good conditions. Love that moss hair helmet! This looks the such a fun place to visit, I hope to see it someday. Thanks, Cynthia. Sorry for the late reply, but I’ve been away from home since last Thursday, with no internet! I’d planned to respond to comments while I was there, so it was a bit annoying. The moss hair helmet is great. Some of the helmets had the hair fixed the other way, i.e. from front to back. I’m sure you’d love to see Vindolanda. All I can say is, ‘Never say never’. No problem, Millie, I’ve been away from my blog a lot too. I hope to visit it all someday! For some weird reason I find the wig, shoes and models the most fascinating. Thank you so much for commenting. I’m afraid to say, this is a very late reply because I just came across your comment in my spam! Goodness knows why it was there, other than you’re a new blogger. I know I’ve been on your blog since this post was written in April, although probably not often. I’m not on my blog as often as I should be nowadays. In between writing my book and going away, things have got very behind. I’ll try to pop over to your blog sometime in the next few days. Thoroughly enjoyed this, Millie Thom. Wonderfully informative narrative and pictures. Paint me green with envy. Vindolanda is a special place and there’s so much to see. You’d love it, Jack. The details about all the people and the way they lived and worked are invaluable – especially the letters. Thank you, Jack. Another great read Millie. Haven’t been to Vindolanda, but I the parts of Hadrians Wall which I was lucky enough to see were fascinating enough on their own! I have, when I first went backpacking around Europe we went all around the UK and Ireland and most of Scotland. It was a an amazing experience. We even went to a Rob Roy’s grave! We’ve been watching a new show called The Last Kingdom which you might find of interest- it’s based on a series of booked about then the Normans had first invaded Britain and England hadn’t yet been formed.. Really interesting. By the way, did you hear about the Druid temple recently discovered in Scotland? Amazingly well preserved – they’re thinking of putting it on the world heritage list..
Hello Heath. Yes, it’s been a while since we chatted. I’m not on my blog as often nowadays. The third book is coming along well but I’m also putting together a book of flash fiction. I haven’t enough stories on my blog for a book, so I’m writing more to add to it. 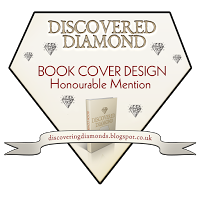 The banner only includes images from Books 1 and 2, as I haven’t had a cover done for Book 3 yet. I’ll have a new banner made when that cover is done. I hope your dramatizations are going well, too.